Cats love Peppa Pig World! Shocked staff at Peppa Pig World, had to put on their capes last weekend and save a Tabby Kitten! 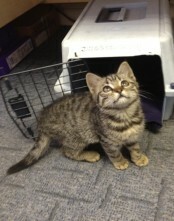 The kitten had snuck in to a car radiator compartment and travelled 133 miles! That’s about 1000 Football Pitches! The staff saw a little paw poking out the front of the car and set to work on a rescue mission! The heroes managed to save him in the end and he wasn’t hurt! Although next time he goes to Peppa Pig world, he’s sitting in the passenger seat! Whilst we can’t promise that you’ll see another super hero rescue mission, there are some pretty cool rides and you can even visit Peppa’s House! Maybe it’s worth a visit before the summer holidays are over. Click here for more information about Peppa Pig World and Paultons Park!